A few top level domain names have sold an impression amount of premium domains prior to general availability. Here are three new top level domain names to keep an eye on: .Club, .在线 and .中文网. .Club Domains is an “all-in” registry, meaning it has only one new TLD to offer. The company raised $7 million and spent a decent amount in a contention set auction for the domain. Still, it has millions of dollars to spend on marketing. For example, it has paid for prominent positioning on GoDaddy’s home page. As of yesterday, .Club has sold $481,388 worth of premium domain names. A bunch that just came across Sedo’s sales list were sold to a construction firm in Ft. Lauderdale. Some big brands are getting involved, too: MaryKay bought beauty.club and makeup.club. Given the growth of subscription based products, I expect .club to do really well out of the gate. Dot Chinese Online (.在线) and Dot Chinese Website (.中文网), both offered by TLD Registry, have combined for over $584,000 worth of premium domain sales since landrush started March 20. That includes a live auction held in conjunction with Sedo that sold $182,000 worth of domains. It doesn’t include over 20,000 domains bought by the Chinese government. Given the domains sold to the government, these domains should jump onto the new TLD leaderboard as soon as they enter general availability. In fact, they’re already in the top 20 and general availability doesn’t even start until Monday. The .Club domain name enters landrush tomorrow, and already the domain name is showing solid early results. Point in fact: English.club sold for $17,500. Add to that TLD Registry’s $181,000 haul a couple weeks ago and premium domains appear like they might actually pull in decent sums for new TLD operators. .Club has also convinced MaryKay to buy makeup.club and beauty.club. I gather the difference between these TLD’s sales and others is that they’re actually going out and selling domains rather than waiting for buyers to come to them. After all, MaryKay doesn’t own MakeupClub.com and BeautyClub.com, but someone sold them on the idea of owning the .club domains. It takes outbound sales to make this sort of thing happen. This also shows there may be an opportunity for domainers who are willing to put in some leg work. Find those registries that aren’t holding back all of their premiums, buy them at reasonable prices, then find buyers who may not have been aware that new TLDs were coming out. TLD Registry inks deal with Chinese government for over 10,000 domains in each of its new TLDs. 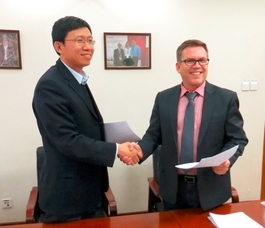 Pictured: Director LI Qingfeng, The Service Development Center of SCOPSR (China’s own registrar) and Arto ISOKOSKI, CEO, TLD Registry Ltd.
TLD Registry Ltd, which is launching the new top level domain names Dot Chinese Online (.在线) and Dot Chinese Website (.中文网), has inked a deal with the Chinese central government’s own registrar for 10,226 domain names in each of the new internationalized TLDs. The domains include the names of every city in China with populations of over 200,000 people, all 3,000 counties, all provinces, all municipalities, all Special Administrative Regions, and a number of key locations such as mountains. Usage by these entities could be a big viral marketing benefit to the registry. TLD Registry notes that China’s Ministry of Industry and Information Technology (MIIT) has made it a requirement that all Chinese government websites to transition to fully-Chinese domain names. The landrush for these two domain names starts on Thursday, and TLD Registry is holding a launch party with a live and online auction this Thursday and Friday in Macau.